New Jersey to Arizona Freight shipping and trucking services are in high demand; Trenton, NJ to Flagstaff, AZ is a very well traveled route. The Newark to Phoenix route is a 2,397 mile haul that takes more than 36 hours of driving to complete. Shipping from New Jersey to Arizona ranges from a minimum of 2,110 miles and 31 hours from Penns Grove, NJ to Sanders, AZ to over 2,618 miles and a minimum of 39 hours on the road from Newark, NJ to Yuma, AZ. The shortest route from New Jersey to Arizona is along I-40 W through Albuquerque, Oklahoma City, Springfield, St. Louis, Columbus and several other major cities making it an excellent path for LTL freight shipments. Freight Rate Central offers people who need to ship freight to, from and inside New Jersey the industries best rates. It’s all about our efficient scheduling system and our wide variety of options, including provision for oversized, overweight and specialized loads. Get a free instant online freight quote and find out why our service is the best out there for New Jersey freight. Whether you need an estimate for a full truckload, less than a truckload or international shipping, you can be looking at a quote in five minutes or less. New Jersey to Arizona Freight shipping quotes and trucking rates vary at times due to the individual states industry needs. 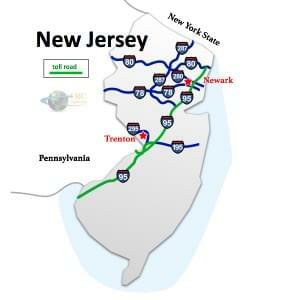 Since New Jersey is mainly industrial and Arizona is largely manufacturing, also with many food processing and distribution centers, we see plenty of shipments by dry van trucks, refrigerated trailer, as well as flatbed trucks and trailers. Our Less Than Truckload (LTL) carriers in both New Jersey and Arizona are also running a number of regular services between the two states, and it’s an active route for heavy haul freight shipments, as well.